I usually don't post a lot of bloggy savings on Sunday, because I usually am not at the computer! 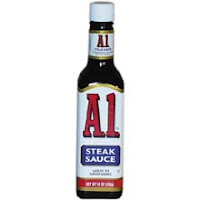 But, because of the rain, I have been cruising around, and I came across this great A1 Steak Sauce deal. It is for $2/1, and I was able to print out two. Hurry, because these go FAST!! marvelous indeed with those freebies and recommendation of yours.. take care!